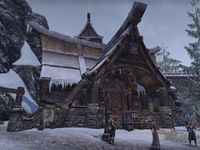 The Adept's Retreat is a chironasium, apothecary and outfit station in Windhelm. The outfit station is set up right in front of the building. A cooking fire, one alchemy station, one jewelry station and one enchanting table can be found inside, along with two bookshelves that can hold skill books. All storage containers in the Retreat, including two baskets and several barrels, are owned. Jaritra can be encountered on the front porch, drinking. If you talk to her, she will mark the Chill Hollow cave on your map.